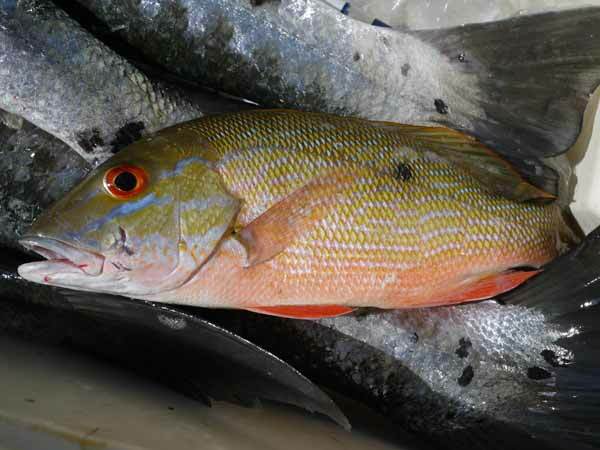 Belize is known for its amazing fishing, and snappers are only one of the delicious fishes in its waters. One of Belize News Post’s contributors recently fished off the shore of San Pedro. 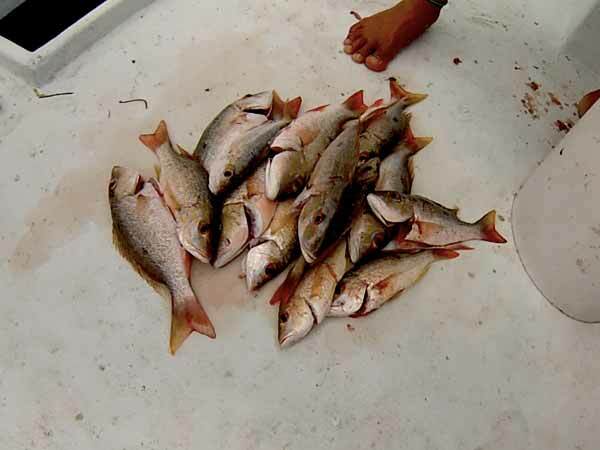 Although it has been noted that Belize’s water might be becoming over-fished, they still had a great fishing trip, and were privliged to eat what they caught. It is becoming increasing rare in our world to be able to catch and eat an animal, not wasting any part of it, and experience a cuisine that doesn’t get any fresher. 3 Fresh whole snapper (Red, Mutton, Mangrove, Black, Your Choice), gutted and washed (Rinsed in limed water). HEAD-ON. After rinsing the fish in limed water be sure to let it sit for a minute or two on paper towel or something similar to remove any excess moisture to avoid the frying oil splashing. Slice the fish diagonally about 1/4 of the way through the fish on each side. This will allow the fish to cook completely through and it will allow for better seasoning. The fish seasoning is really simple: Seasoned salt and black pepper. 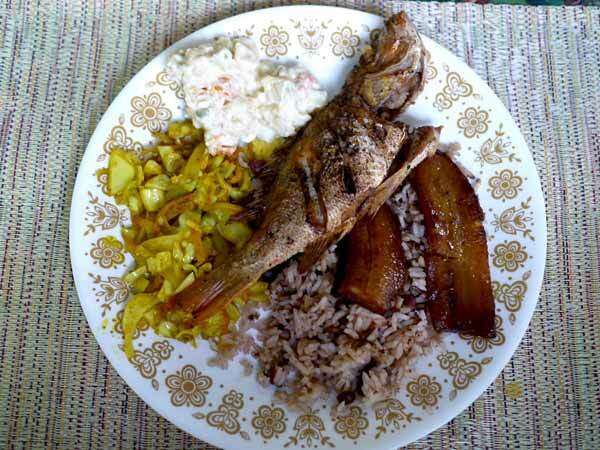 For Belizean style fried fish: the seasoning is heavy on black pepper. The consistency you are looking is that of a light rub. Use a cast iron pan for great results. 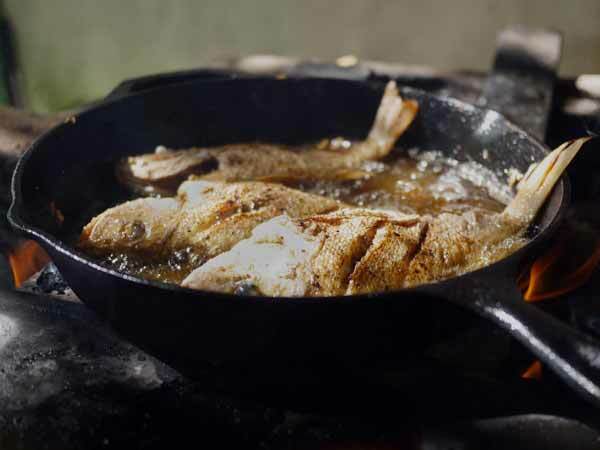 Pre-heat your frying oil, it’s essential the oil get hot enough to fry the fish quickly to avoid soaking in too much oil. There is some finesse to getting the oil heat just right. It needs to be hot enough to fry properly but not so hot that is burns. In Belize there is not variety of oils available. My grandma uses vegetable oil or if heart attacks are not an issue and it can be found, coconut oil is a traditional option. You need enough oil so that the fish are about half deep in the oil. As the fish is frying use a spoon to keep hot oil moving over the sides and top of the fish. The fish should cook in under 10 minutes. About 5 minutes a side. This does depend a little on the size of the fish and the number of fish you are frying at once. Once the fish is fully cooked remove it from the oil and let is rest on a paper towel so remove the excess oils. Serve with Belizean Rice and Beans, with a side of coleslaw or potato salad.